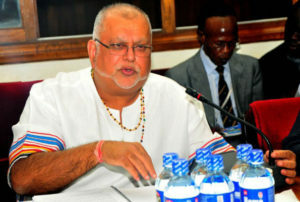 Business mogul Sudhir Ruparelia today, Thursday appeared before the Commission of Inquiry into Land Matters in connection with his acquisition of Kololo Secondary School playground in 2014. Appearing before Justice Catherine Bamugemereire and team, Mr Ruparelia was tasked to explain why he did not consult the management of Kololo SS in applying to the Uganda Land Commission (ULC) for the lease of the land located on Plots 60 to 69 along Lugogo Bypass in Nakawa Division. The Kololo SS board of directors urged the probe team to cancel the land titles issued on the land, claiming they were illegally acquired. Mr Ruparelia is accused of acquiring the land for Kampala Parents School. However, the businessman testified that he followed the law in acquiring the lease with guidance from the Uganda Land commission (ULC). He said in 2013, he was informed that there was a planned partnership between Kololo SS management and Demark, a company, to develop the disputed the land. “I got concerned that we were going to lose a play field which we were using as a school and I contacted my lawyers to find out the exact owner of the land comprised of playground and they said it belonged to ULC,” said Mr Ruparelia. In response, the businessman wondered why Kampala Parents School 2014 lease is being queried yet the entire disputed land has since been titled and given to 15 other developers, including Nanjing Hotel. He added that he then contacted the late Mayanja Nkangi, the former ULC chairman, and proposed to set up a modern sports facility on the land. “I applied through the normal procedure and it was within the powers of ULC to grant the lease,” he said. However, the probe team castigated Mr Ruparelia for not carrying out proper due diligence on the land by consulting the community that was using the playground and other stakeholders. However, the commission faulted Dr Ruparelia for failing to adhere to the rightful procedure like carrying out proper due diligence, consulting the community that was using the playground and other stakeholders. Evidence before the commission indicate that ministers Charles Bakkabulindi (Sports) and Frank Tumwebaze (formerly presidency and Kampala) issued letters of no objection to Kampala Parents School to acquire the leasehold title.